We’re just surprised that it took this long for the market to find a decent alternate to the terrifying animatronic band, sensory overload games, and pizza that tastes like ketchup on a saltine that define the average Chuck E. Cheese’s experience. But a rise in available real estate has put the Cheese’s dominance of the kids’ play area market in peril. 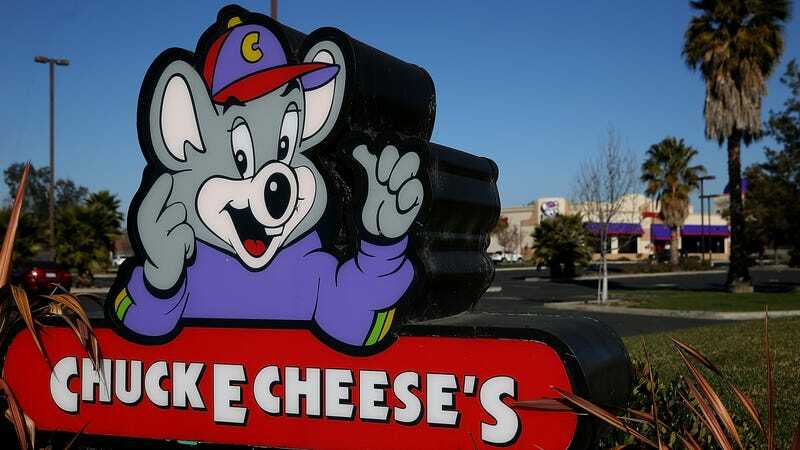 Nation’s Restaurant News reported last week, “Drawn by inexpensive real estate in the wake of the brick-and-mortar retail shakeout, independently owned bounce houses and trampoline parks have soured sales for kid entertainment venue Chuck E. Cheese’s.” The chain saw a 6-percent loss in the last quarter of 2017. Since kids really just want a place to run around in—and maybe are less interested in how many rows of worthless tickets they accumulate from playing games—these bounce houses and trampoline parks are proving profitable for non-mouse-band-related startups. Parents can also rent bouncy houses for birthday parties and block parties and the like (the hottest trend in my neighborhood last summer involved combination bouncy house/water slides). Faced with a sinking market, the execs at CEC are revisiting some of the chain’ elements, like birthday parties and a time-based play punch card. While CEC is reevaluating itself, for the love of god, we hope that the bigwigs reconsider the place’s menu, especially that pizza recipe. We defy anyone to come up with a slice worse than the one you get at Chuck E. Cheese’s.